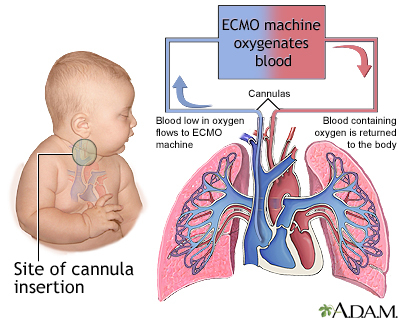 Extracorporeal membrane oxygenation (ECMO) is a treatment that uses a pump to circulate blood through an artificial lung back into the bloodstream of a very ill baby. This system provides heart-lung bypass support outside of the baby's body. It may help support a child who is awaiting a heart or lung transplant. Carlo WA, Ambalavanan N. Respiratory tract disorders. In: Kliegman RM, Stanton BF, St Geme JW, Schor NF, eds. Nelson Textbook of Pediatrics. 20th ed. Philadelphia, PA: Elsevier; 2016:chap 101. Crowley MA, Stork EK. Therapy for cardiorespiratory failure in the neonate. In: Martin RJ, Fanaroff AA, Walsh MC, eds. Fanaroff and Martin's Neonatal-Perinatal Medicine. 10th ed. Philadelphia, PA; Elsevier; 2015:chap 78. Kimberly G Lee, MD, MSc, IBCLC, Associate Professor of Pediatrics, Division of Neonatology, Medical University of South Carolina, Charleston, SC. Review provided by VeriMed Healthcare Network. Also reviewed by David Zieve, MD, MHA, Isla Ogilvie, PhD, and the A.D.A.M. Editorial team.